AM2R is currently split into multiple projects. Besides the main game, there are features that are being developed in reduced versions of the engine, for faster compiling. One of those had a lot of steady progress lately, and it's very close to be fully implemented in the game: Localization support. Translating Confrontation to multiple languages was quite a challenge, and the results were mostly good. But one of the things I considered this time was Unicode support. Now, if I manage to implement a good enough pixel font, there will be support for extended characters, and even more languages can be supported by the game. The font I'm using now is slightly bigger than the old one, this also makes reading the logs a bit easier on the eyes. The text in the game is still changing every once in a while, so translation efforts will be considered after the game is done. The game will be available in both English and Spanish upon launch. As for the main project, I couldn't find that much free time this month. Area 5 is almost good enough for the testing phase to begin, but there's plenty of little details left to fix. With some luck, the next update will have more cool stuff to show about the later areas. Thank you all again for following the project, and remember to post any questions or suggestions either here or at the Forums. Thanks for the update mate. Keep up the good work. Could you please send me your paypal email or a bitcoin address? I would at least buy you a bear. Aunque ya lo anunciaste hace tiempo, siempre es bueno ver capturas localizadas. Is there a Release date for the next update? I would suggest that you make it somewhat modular (or... something? ), I think it should be simple for the user to get the game to choose one and that be handled by language files or something like that, rather than have to download an entirely different build. I understand how troublesome setting that up would be, though. But it'll be better that way if you plan on keeping the game updated. I don't know if I should be proud or ashamed that I could translate this news post's subject line without knowing much Spanish. Hi, I'm a student and I would like to contribute to this project by offering my skills as a translator, and maybe help you with the translations and texts while you work in other areas of the game. Of course I would totally do this for free. You can contact me from my email (theneo0z@gmail.com) or from my twitter: @TheNeo0z. The Queen Metroid has been completed, get hype. I doubt there's any way this would be allowed to last on Steam. And it will always be free. Hey, Dr. I can help translating to Spanish. I'm a native spanish speaker and I always like to contribute with English-Spanish translations for something I love! Hey, Dr. Yo puedo ayudar con la traducción al español. Mi idioma nativo es español y siempre me gusta contribuir con traducciones del inglés al español para algo que amo! will the next update be available by the end of this year, or soon? I live and die by your update posts man. I can't wait for the next patch update!!! Hey Dr., if you ever want to translate the game to Brazilian Portuguese, know that I'm available. Also, if you do, make sure to have Portuguese from Portugal (pt-pt) and Portuguese from Brazil (pt-br) as separate languages. There's just enough difference that the two can't be grouped together. Hello Dr. I 'd like a lot to help translating the game since i'm a french native. I can translate from English to French. PS: That is a very interesting update, I hope the game launches very soon! I have been watching your work for almost two years and I must say Your work is absolutely magnificent! A fan couldn't wish for more! Amazing job, and keep up the hard work! Dr.m64 I would like to test this game out i am skilled not very skilled but skilled because ive been playing the updated version 1.41 lately and id like dedicate my skills into helping test this game out please consider me into helping you with this project. You are my hero dude. I would never be able to work on such a massive project by myself without quitting long before this point. If you need translation help from English to Swedish I would love to help. Contact me on oscar@raccoon.se if interested. ya no me acuerdo desde cuando llevo siguiendo tu proyecto. Apuesto que más de 6 años. Espero que JAMÁS dejes de trabajar en él. Cuando comencé a seguirte apenas estuve aprendiendo a programar. En cuanto salga pagaría DE CABEZA por tener una versión física que se asemeje a una caja de Gameboy aunque luego integre un CD con el juego. Quizas con suerte en cuanto sea papá podré gozar de este juegazo. Sigue así, esperaremos con ganas cada update como siempre hacemos! Hola quetal . me gustaria sugerir que le quitaras la animación que tiene samus cuando esta sin moverse ya que la animacion que tiene puesta no le queda muy bien. PD: sigue asi . tu trabajo es excelente . te sigo desde que empezaste con el proyecto! metroids are cute but I hate the raptor and t Rex related metroids! OMG that guy Janus at the top of the comments wants to buy you a BEAR!!! A MODAF$#^%&ING BEAR!! anyways, if theres anyway to donate or buy a pint, id like to do so. keep up the good work! Hola amigo. Me encanta el tema de la localización. Por supuesto que sabes que incluso entre los latinos tenemos muchos regionalismos, palabras y estructura de frases que se usan en México y no en Argentina y vice versa. Una vez liberes tu juego, (y yo lo termine de jugar) me gustaría hacer una revisión al texto para localizarlo a español Mexico. O por lo menos, asegurarnos que tienes un español neutral. It's good to see a progress like this! Also, I'm avaliable to translate for Brazilian Portuguese as well. Since this is a fan game that would actually be a terrible idea because valve would investigate the game for copyright infringement. Not to mention that Nintendo will also notice that there's a fan game getting too vast. They'll shut this project down. Porting it or even having a drm makes keeping this game so much more difficult. Keep up the great work. We all love you. Actually, I was thinking: as a bonus, would you consider (or are you planning) on including the original music? Maybe as a reward for beating the game, enabling the original gameboy music would be a lot of fun and nostalgic. Recuerdo cuando jugué este remake en el 2012! Comparado con el actual eso no es nada! están haciendo un trabajo increíble con este proyecto y espero que nunca lo abandones!! Me encanta la idea de la traducción ya que hay algunas personas que no saben inglés y seguro esto les vendrá de maravilla!! Sigan así! y Saludos desde México! I remenber when y play this rameke in 2012!! Compared with the actually that's nothing!you're making an awesome job with this proyect and I hope you never leave it! I love the idea to translate because there's some people that don't know english and sure it would be wonderfull to they! Keep it up!! and greetings form México! Hello, I've started playing version 1.34 again (didn't get around to completing it last time due to a surge of other games taking over)and I'm aware of version 1.41 which has recently been released. But I won't play that and instead will wait for the next update. 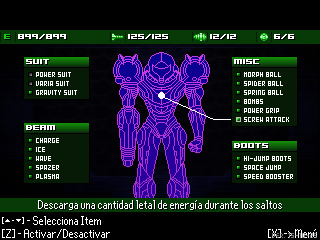 Anyway, I wanted to suggest an improvement which you could make with Samus' morph ball animation. It's something I noticed in Super Metroid and found it quite neat. In am2r project, when you are in morph ball mode, no matter which direction you roll/face, the morph ball is always spinning clockwise. It would be nice if you could tweak it so that the morph ball spins anti-clockwise after rolling left (or facing left to start with). To conclude, I'm loving this demo as always and it's quite a fun challenge on hard mode. Keep it up! Not sure if it is a bug. but when I had the Metroid count to Global; apparently the game still counted 6 "awake" Metroids and wouldn't reduce the lava, I was running around like a mad man trying to find the last 6. After a while I switched it to Local metroids to see if I was missing any. And all a sudded the Lava started to go down. I was playing the current 1.41 demo. And was in the last section. 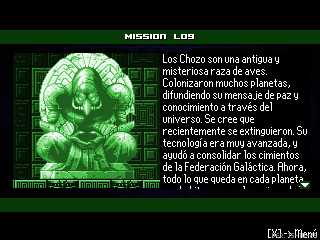 Just found it weird that it was still saying there were 6 Metroids alive, which would cause the lava not to sink. Might want to look at that. Any hopes for italian translation? 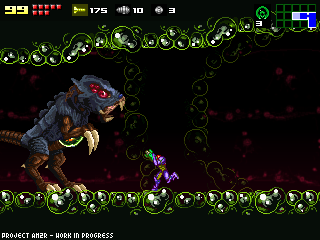 make sure you animate the heck out of mother metroid eating you and vomiting you up! maybe with her sliding across the floor in goo with a clear impression on her body movements "did that really just happen" lol can't wait to see it!